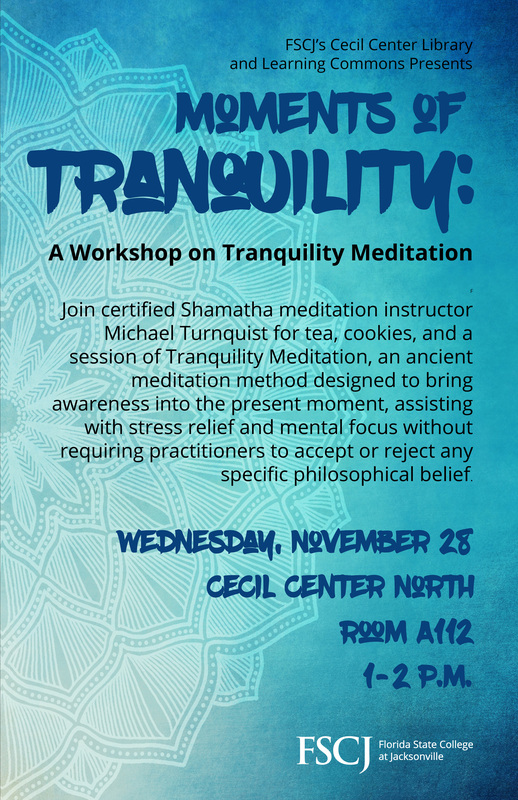 This stress relief Workshop will focus on the practice of Tranquility Meditation, an ancient meditation method practiced originally throughout India and Central Asia. This meditation practice is designed to create a state of peace, without creating an altered state of consciousness nor a state of mental chloroform. It is principally designed to bring awareness into the present moment and does not require the practitioner to accept or reject any specific philosophical belief. Currently practiced in the United States by well over 300,000 practitioners, this meditation technique calms the mind while, co-emergently, creating a clear state of awareness. This practice is an excellent stress reliever and effective in focusing the mind, allowing the individual to focus one-pointedly on any topic. A great method for help with school work and on- the- job activities! Instructor: Michael Turnquist-Certified Shamatha Meditation Instructor with over 30 years’ experience of teaching and practice. This workshop will take place at Cecil Center North, room A112, on Wednesday, November 28 from 1-2 p.m.